Suggested inquiry questions: What happened at the Trimdon Grange Mining Disaster? How can we use historical research to write a report? For three days between 19 and 21 February 1882, the people of Trimdon Grange and Kelloe buried 74 people. Some were buried in mass graves. Others were laid to rest in a cemetery a few miles away. Most people in Trimdon Grange buried someone in their family. Many of the dead left behind young families. What caused so many people to die? Was it disease, famine, illness or murder? You are a reporter for The Trimdon Herald. You have to write an accurate story about these deaths for your newspaper. You must study the evidence carefully, putting all the pieces together like a jigsaw. When you have finished looking at the evidence you can write the story. 1. These are some of the burial registers for Trimdon Grange in 1882. What things do all the victims have in common? Can you find any families? Who was the youngest victim? Who was the oldest victim? 2. This is an extract from the Durham Advertiser showing those who were killed and those who were rescued. What clue is given here about how these people died? How many boys were killed? How many children lost their fathers? How would the lives of these children change now that their fathers were dead? 3. This is the account of Ralph Wynn, a survivor of the Trimdon Grange disaster. What did Ralph see when he reached the shaft? Why could he not get out of the mine? After Ralph had waited for about an hour what did he see? How well were these men? What news did these men bring? How did Ralph and the other men get out of the mine in the end? Ralph was there at the time. Does this mean that we should believe everything he has to say about the explosion? Can you now say why 74 men were killed? 4. This is part of the official report into the Trimdon Colliery disaster. What was the date of the explosion? What was the time of the explosion? Where was the place of the explosion? What types of lamps were used? How ‘gassy’ was the mine? How strong were the roofs of the mine? 5. This is a photograph taken inside a mine. The inside of Trimdon Grange colliery would have looked much the same. What kind of lamp is the miner holding? How is the roof of the mine being held up? Can you see any special safety equipment in the mine? 6. Why was there an explosion at Trimdon Grange colliery? Try to work out what happened. Coal was one of the most important things in Victorian life. It provided heat for homes and fuel for cooking. It was also the fuel that ran the country’s factories and railways. Britain was rich in coal. It could be found right across Scotland, Wales and England. 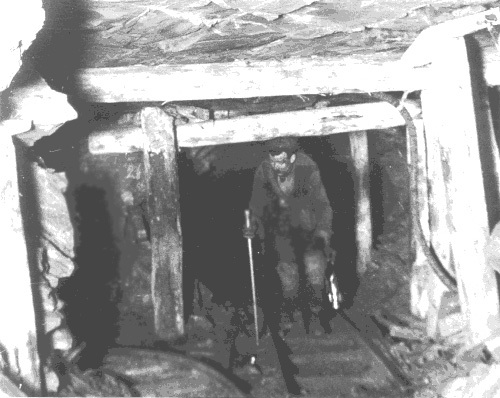 In some mines ponies were used to move carts of coal to the shafts where they would be winched to the surface. The new mines that grew up in the 19th century depended on men and children to work long hours in often dangerous conditions. Accidents were common. As mines became bigger and deeper new problems emerged. The most frequent dangers were those caused by flooding, dangerous gases and the roof falling down. Firedamp (a build-up of gases) was even more dangerous. It could cause massive explosions. The problem of lighting was also a serious one. Candles could set off explosions. It was not until 1815 when the Davy lamp was invented that this danger was removed. The Davy lamp had a piece of gauze around it which stopped the flame from setting gases on fire. Throughout the 19th century the government had passed laws which prevented young children and women from working in mines and reduced the number of hours they were allowed to work. By the 1880s only boys who were over 12 could work in mines. However, some mine owners ignored these laws. Students may find some of the vocabulary and language difficult, especially in the Inspector’s Report. However, the background and the transcripts for all written sources provide short glossaries. The lesson has an inquiry led approach. Students will need to be observant and it is worth encouraging them to use their knowledge of Victorian Britain to think about the possible causes of the deaths. Try to impart some of the tragedy of the unfolding events to the pupils. Our lesson on Trimdon shows part of the census return for the town before the disaster, and some of the victims who can be seen in the death registers in source 1 are shown in its sources. The death of a breadwinner could have dire consequences in the 19th century. The workhouse loomed for mothers who could not find alternative means of supporting their families. Besides, what work could they find in places like Trimdon Grange where mining was the main, if not only, industry? The survivor’s account finally confirms some of the gruesome details of the disaster. Names are mentioned here and can be cross-referenced with the burial registers and newspaper lists. Although Ralph Wynn provides crucial information, as a man caught up in the centre of dramatic events, his account may be less than reliable. Students should try and evaluate Ralph’s account. What parts might have been exaggerated? What might be the impact of the editor of the newspaper? The Inspector’s Report provides factual information to help support their final piece of written work – a newspaper report.